Valley City (CSi) Music at the City Park Bandshell in Valley City features “Tucker’d Out” on Wednesday, July 11 starting at 7:15-p.m.
“Tucker’d Out” , from Fargo, is returning, sharing a variety of music, Come early & enjoy tacos in a bag starting at 6:30 pm. The first 200 will be served. Tucker’d Out came together in the fall of 2006 after a year of living room jamming. Brothers John and Lynn Trelstad had performed as a duo in the 80’s and “brother from a different mother” Jeff “Petey” Petrik had a long love affair with bass guitar (and upright). These brothers in music struck common chords and blended harmonies that their listeners responded to with enthusiasm. Tucker’d Out was “discovered” by a TV audience with the somewhat spontaneous performance of an original song penned in the days before the crest of the Red River flood of 2009. Calls and e-mails followed their performance of “The Flood of ‘09” on KVLY’s “Valley Today” program and soon a recording was made to elicit $10 donations for the Salvation Army and almost $4000 was raised. 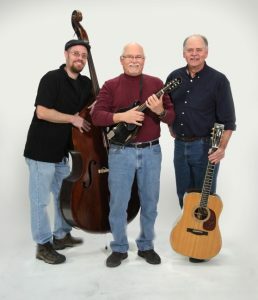 In the fall of 2011, Petey and his wife Pam accepted dream jobs in Madison, Wisconsin where their now two granddaughters live and outstanding bassist Ryan Haug brought his upright bass “Martha” to the group…and the Tucker’d Out music keeps on going. Their number one goal is to have fun and people respond by calling what they perform “feel good” music, and that’s what seems to keep their phone ringing. Check them out at www.tuckerdout.com. We hope you enjoy our blend of harmony that we’re proud of. It’s driven by a select few acoustic instruments we like to use. We call our blend of music, “Feel Good Music!” Starting from a few original songs to a long list of great traditional songs to songs by Bob Dylan, Lyle Lovett, Tim O’Brien, John Prine and many other great songwriters. We’d love to meet you at one of our upcoming gigs!You’ll hear some harmony, a couple of guitars, great upright bass, a little harmonica and mandolin. Most of all, however, we have some great songs that we think anyone would like if they only knew they existed – from original songs, Bob Dylan, Lyle Lovett to John Prine and many others.